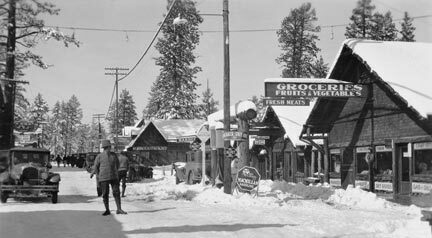 Before 1915, the Big Bear Village was not much more than a collection of small resort camps. The Big Bear community was centered around the huge Pine Knot Lodge, which was located just south of today’s village. 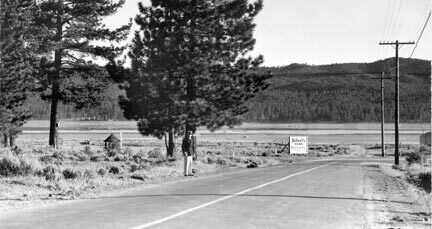 In fact, the local community was known as Pine Knot up until 1938, when the name was officially changed to Big Big Bear Lake. The photo at the very top of this web page is of the old Pine Knot Lodge. 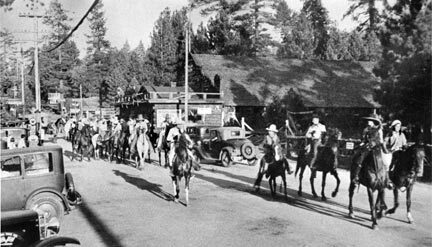 However, it was the completion of the Rim Of The World Highway to Big Bear that triggered the evolution of that small group of resort camps below Pine Knot Lodge into the village that we know today. The photos in this album documents that evolution. This is what Village Drive looked like in 1919. This view looks west from what we know today as the Village Drive/Bartlett intersection. The barely visible dark building on the left is the Big Bear Pavilion. Check it out below. — Rick Keppler Collection. 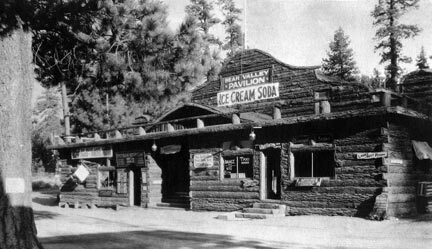 The Big Bear Pavilion was one of the first major commercial buildings in the Big Bear Village. It was located where the Village Theater on Village Drive is today. — Rick Keppler Collection. This early 1920’s panorama view looks north down Bartlett Boulevard towards the Big Bear Lake, and east along Village Drive. Except for the newly constructed Navajo Hotel across the street there is not much going on at this end of town. — Rick Keppler Collection. This panorama photo was also taken in the early 1920’s from the same spot as the previous photo. This view looks west down Village Drive. Across the street is the Bartlett’s Camp general store. On the far left is the new Chad’s building is under construction. — Rick Keppler Collection. Heller’s was the most prominent building at the west end of the village. Today it is known as the Village Trading Post. Across the street is the Cottage Lane intersection. — Rick Keppler Collection. 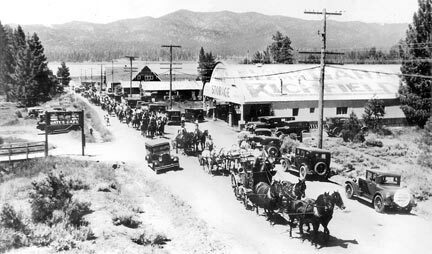 This 1920’s parade down Village Drive was the forerunner of today’s Old Miners Days parade. The Big Bear Pavilion building dominates the background. — Rick Keppler Collection. Another 1920’s parade. This one is coming up Pine Knot Avenue. Big Bear Lake can be seen in the background. — Rick Keppler Collection. 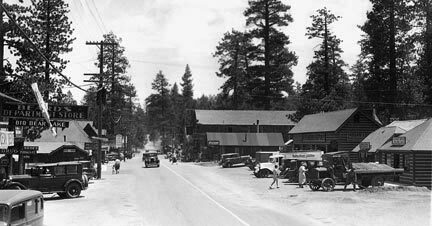 This 1920’s photo of the lake was taken from the Pine Knot Avenue and Big Bear Boulevard intersection. 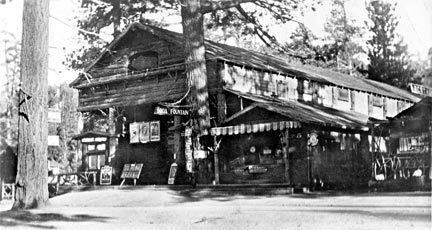 This was many years before Pine Knot Landing or any of the other commercial buildings were built on what is today’s busiest corner in Big Bear. — Rick Keppler Collection. The GRIZZLY THEATER, was located on the south side of Village Drive west of the Big Bear Pavilion. It was built in 1920. At the big grand opening, customers had to bring a box or something to sit on, because none of the seats had arrived. — Rick Keppler Collection. 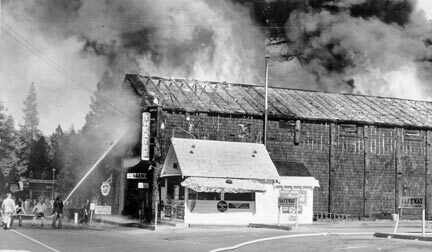 The Grizzly Theater was destroyed by fire in June of 1941. A new theater was built on that same spot, but it also was destroyed by fire about 25 years later. The Grizzly Theater was located where Jack In The Box is today. — Rick Keppler Collection. This view looks east down Village Drive. Big Bear Village had the only paved road in the valley. The Rim Of The World Highway into Big Bear was dirt. — Rick Keppler Collection. A 1920’s winter scene, looking west down Village Drive from the Bartlett intersection. This taken back when the village community was still known as Pine Knot. — Rick Keppler Collection. MORE VILLAGE PHOTOS ON THE WAY.